While we keep our fingers crossed for scallops we are also starting Southern Hard Shell Clam restoration, with our first clam babies already growing in the hatchery. Clams grow more slowly and need up to 2 years to reach adult stage – so it will be late 2017 before they are ready to release into the bay. However, clams are resistant to red tide, tolerate high temperatures and lower salinity from stormwater runoff, and they live for 30 years or more! Southern Hard Shell Clams were once abundant in the bay, and will be a great addition to our restoration mission to bring shellfish back to the bay. Sarasota Bay Watch’s annual Fishing Line Cleanup was November 5th, hosted by or friends at the beautiful Sarasota Sailing Squadron. SBW volunteers fanned out across the bay to pull fishing line, hooks and other tackle out of the mangroves around our bird rookeries. We again collected miles of abandoned fishing line, which is a lethal entanglement risk for sea birds. Kudos to all those community volunteers who donated their Saturday morning to help out our local sea birds! 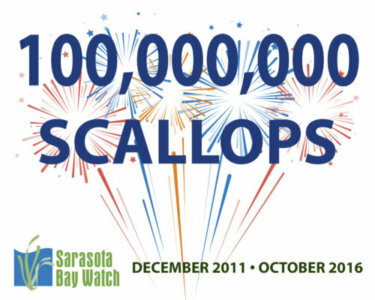 The Marine Debris program is growing by leaps and bounds! In addition to annual island cleanups and fishing line cleanups – which Sarasota Bay Watch has been hosting for years – we partnered in 2016 with Venice-based Suncoast Reef Rovers for four underwater cleanup event in the Venice area. We are also very excited to be partnering with the City of Sarasota and the Sarasota Police Department to conduct an underwater cleanup of the Saprito Fishing Pier, adjacent to the Ringling Bridge. We expect to recover fishing nets, fishing line, lead weights, hooks, and fishing lures, as well as range of items like cans, bottles, fishing rods, tackle boxes, – in short everything that could imaginably fall off, or be tossed off, the pier. Marine debris, whether on the water, or under it, is detrimental to the environment and a hazard to marine life. Many thanks to the City, the Police Department and the community for coming together to tackle this problem!